I was inspired to make this model by a beautiful photograph of a young deer in mid-leap (in Life in the Wild: A Photographer's Year by Andy Rouse). 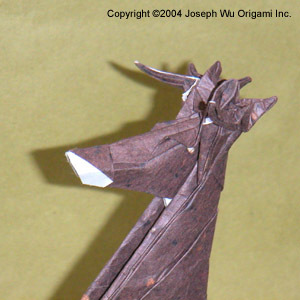 The buck is folded from a single uncut 60 cm square of machine-made brown tissue laminated onto handmade white washi. The finished buck measures 33 cm from nose to hind legs.